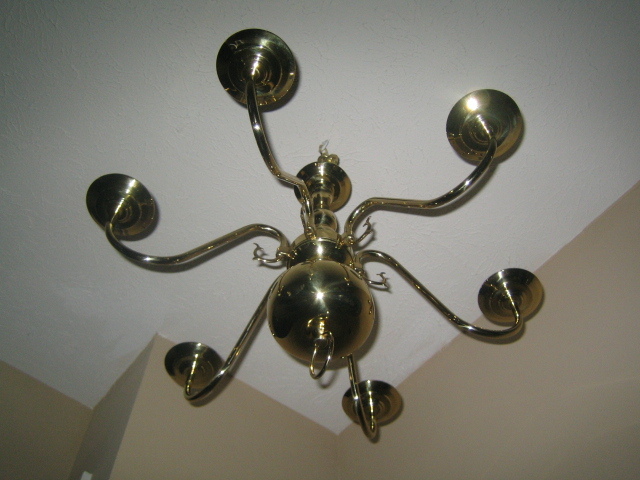 This is an awesome brass Chandelier that I found at a local thrift store. 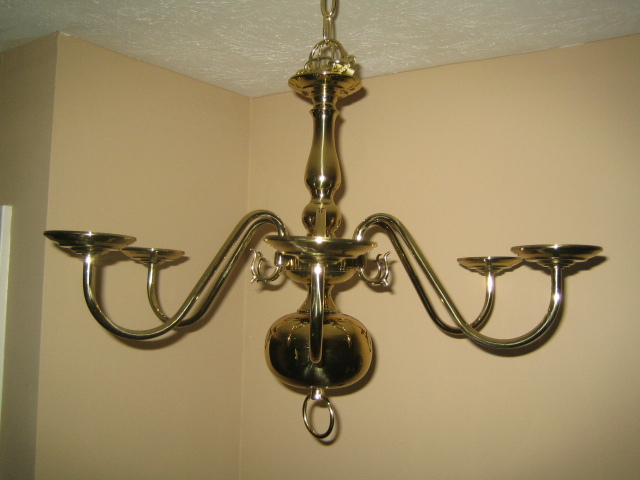 The photo below is what it would look like brand new, however the actual chandelier that I found was dirty and the wiring was cut. 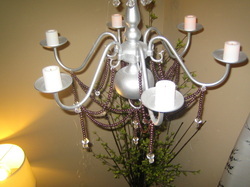 Below is the before and after photos for this DIY Candle Chandelier. First things first, You will need to cut and pull and remaining wires and take part any unnecessary hardware that is still on your used chandelier. You will need to clean your chandelier especially if it's from a thrift store or an item you've had stored in your attic or basement. Cleaning maybe as simple as scrubbing with a rag and soap or even something even more abrasive. This is all contingent on the condition of the chandelier. Allow for drying time after cleaning the chandelier. Prepare an area that is well ventilated or even better and outdoor space to paint your chandelier. Layout your tarp and place the chandelier in the center of the tarp for the spray painting process. Make sure that you are standing 2-3 feet from the chandelier. Shake your aerosol paint can for at least 1 full minute and attach the paint gun trigger to your paint can. Begin spray painting with a graceful right to left/ left to right arm motion. This is to provide for an even spray and prevent dip marks on your final product. 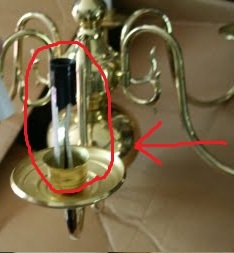 Because the chandelier has many dimensions, it would also be a great idea to spray paint as well in a hanging position to be for sure that no spot on the chandelier is missed. 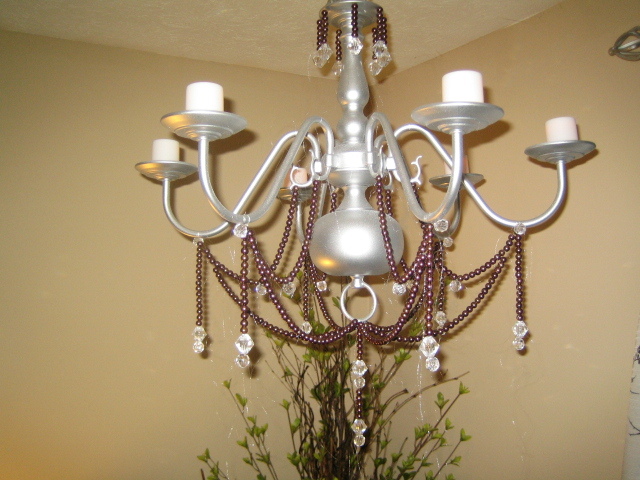 After your done spray painting your chandelier, allow for cure/drying time. 24 hours is a very reasonable time for this process. Now that your paint job is complete and dry, it's time to do the decorative beading to help the chandelier pop visually! You can find these beads at any craft store in your local area or you can even order them online if you prefer. Because loose beads can be very expensive depending on where you buy them, a clever and cheap way to save on the cost of these beads is to use either old necklaces and/or bracelets you have collecting dust in your jewelry case, or even buy necklaces and bracelets at any retailer that sales them. Make for sure that if you go this route, the beads are not fused to the necklace/bracelet string but will fall apart individually after you cut the the necklaces and/or bracelets. This particular chandelier has around 400-500 loose glass beads incorporated onto it. This process will require you to hang it from the ceiling so that you can gain a true visual of how the beading will look as you install each strand. 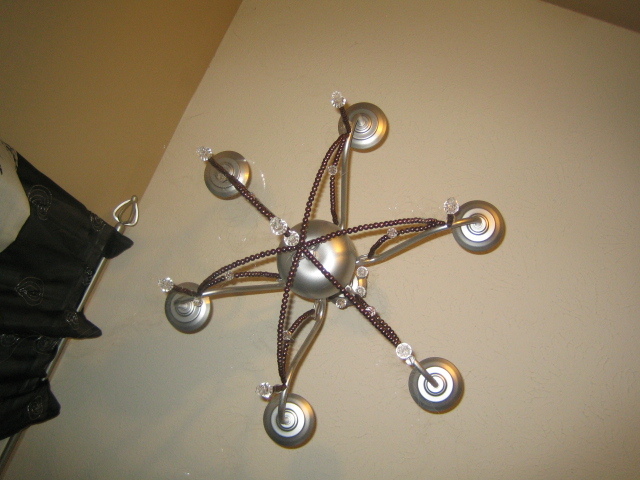 Install your ceiling screw and hang the chandelier from it and begin your beading process. As you find your preferred way to decorative bead your chandelier, tie it in knots at the ends to complete each installed strand. You've finally done beading your DIY chandelier!!! All that is left is to cut off any "hanglings" (a word I made up that refers to the extra invisible nylon strips that remain on your chandelier). 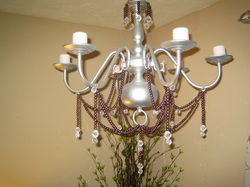 Your DIY Up-cycled Chandelier is done and ready to add a new visual effect to any room in your home. You can add regular wax candles or even battery powered candles to your chandelier.